While visiting San Carlos Borromeo Mission in Carmel, California, last week, I enjoyed looking at their display case of old embroidered vestments. One in particular caught my eye, because it was very similar to another vestment I had seen several years ago on display in Clyde, Missiouri. I thought I’d put the two similar elements up together here so that you can see the similarities, too. Both vestments were certainly hand embroidered. I know for a fact that the vestments in Clyde, Missouri, are hand embroidered, and, looking at the ones at San Carlos up close, it is obvious that they, too, were worked by hand. Both vestments are “Roman” in style – that is, they are oblong rectangles – and in the middle of the back of the vestment (the part that, in the traditional ceremonies of the Church, face the congregation most of the time), there is a round medallion featuring the face of Christ, with a small bit of text surrounding the face. The medallions are centered in an elaborately embroidered cross. The surrounding embroidered cross is not really the focal point here, because, except in size, they aren’t similar at all. The colors are a little surprising. The photo was taken inside, in regular lighting, and the piece was behind glass. Still, these were the colors, more or less – predominantly blues and pinks. The vestment at San Carlos in Carmel featured much warmer colors – golds, reds, deep bluish-greens. The overall look of the two vestments reflect completely different “eras” of art. The top piece, for example, has a somewhat art-nouveau look to it (this style of art being popular from the late 1800’s through the early 1900’s, with the peak of popularity being between about 1890-1905/10 – about a 15 to 20 year spread of time). The second piece, from San Carlos, is more conservative in style and color selection. But the similarities between the faces is what is intriguing. 1. The arrangement – the circle, the text, the face. 5. The lips – though dissimilar in color, the are similar in structure, including the space just below the lips. The hair and beard on the two pieces are different, too – the stitching on the beard on the second piece is much “lighter” and fuzzier looking. The top medallion features very dark lines under the edge of the moustache, which draws the mouth down. Yet, essentially, the two moustaches are the same shape, even to the point of the left side looking less angled than the right. It is pretty clear that the two pieces were worked from the same image as a pattern, but the interpretations are slightly different. My guess? 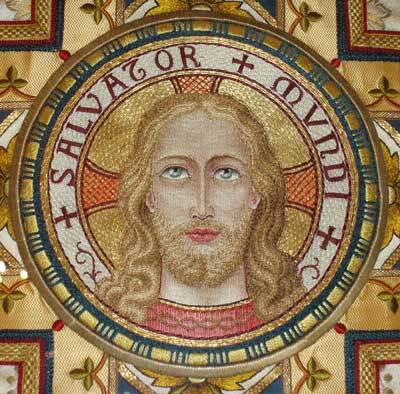 That a line of patterns with this image of the face was available from the late 1800’s through the early 1900’s, but that, though the face was the same, the embroiderer could select from a series of patterns that featured different styles of text, wording, etc., and that the individual embellishment of the cross and halo and the surrounding edge were left to the embroiderer’s imagination and skill. Probably, a catalog of embroidery patterns was available at the time, and convents, houses of embroidery, or individuals selected their patterns from the catalog. That’s just a guess. I have a couple other images from different vestments in different parts of the country that support the notion that common patterns were used (probably ordered from catalogs) in ecclesiastical embroidery found on old vestments. One image in particular comes to mind, so when I find those photos, I’ll put them up for you to see. I thought it was kind of neat to find two such similar images in hand embroidery, some thousands of miles apart, but both in museums that reflect the religious heritage of the area in which they are located. I also like the fact that the choice of colors and the arrangement of design on the back of the chasuble (the embroidered cross) reflect both the individual embroiderers’ tastes and the location / use of the vestment. The second medallion above, for example, is perfect for San Carlos, as far as colors are concerned. The vestment belonging to the first medallion would look entirely out of place in the sanctuary at the mission in California, but it probably worked great in the chapel in Clyde, Missouri. Well, I like second stitching more. But I have one question: what are the colours of this two vestments? I guess, that the second one could be white, maybe golden and it could be used in Easter time; the text (Salvator mundi – Saviour of the World) also proclaims it. But I guess, that while working this evening, I'll try to attribute the first text (Iesu, splendor Patris) for some other feast… It's colours are really very interesting, I'd like to know, when it was used. Very interesting examples. I always find it amazing when I see completed embroidery or quilts that have very similar designs or exact fabric placement in quilts. I also wonder if they were made from kits/patterns of the time, or it was just coincidence. I agree with you, I think there was a pattern common because both are similar images. I've been watching closely and I see the images in both the stitches for the entire area are vertical, isn't it? -Perhaps, following the direction, with the stitches, the folds of the skin and the trajectory of the muscles of the face? I also hope that the idea was expressed correctly in my English! Thank so much for all that you sharing with us! It had to be from a pattern. Notice the highlights on both show light would have come from our left. See the lighter coloring on the bridge of the nose, the hair (left vs. right) and even the sparkle in the eyes. What would be a real treat is to see a pattern from the old days. Did you happen to run across any of those? i find that yellow "disappears" from modern prints that have been hanging on my walls (which seems really funny because mustard will never come out of clothing)! Could fading be a factor in the color differences ? Do you know what techniques were used to embroider them? 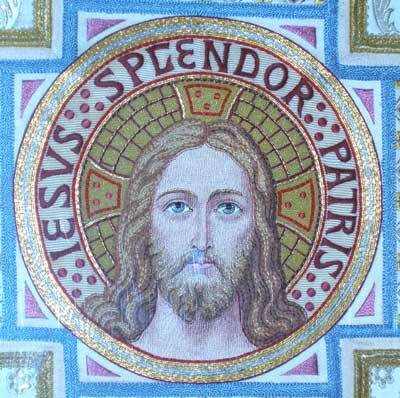 if you search for the Greek orthodox Icons Christ Pantocrator you can see where the style comes from. Previous Previous post: Temari, Anyone?